Your first defence against oral problems such as tooth decay is good oral hygiene. Brushing and flossing your teeth everyday and following your dentist’s oral hygiene instructions can stop a number of dental problems. But, despite religiously following good oral hygiene habits, there is still a possibility that your teeth can be damaged by decay. The molars, specifically, are difficult to reach and brush properly. Plaque can gather in these areas making them vulnerable to decay. To prevent this from happening, we at A Plus Dental recommend a dental sealant. Sealants coat the molars, protecting them from plaque. This preventative dentistry service is best for children but is also recommended for adults. Read on to learn more about dental sealants at A Plus Dental. Dental or fissure sealants are plastic coatings which cover the occlusal, or chewing surfaces of the permanent teeth. These teeth are the molars and premolars. Sealants can also be placed on other permanent teeth with early stages of decay to prevent its progress. Sealants are best for children whose molars have just erupted. But they are also recommended for any age group to protect the teeth from decay. Molars are areas in the mouth that are extremely difficult to brush. Aside from their position, molars also have grooves or fissures, which are deep and difficult to clean during brushing. Add to that is the fact that children tend to be bad at brushing. Without adult supervision, they can’t correctly brush their teeth, particularly the back ones. We recommend placing dental sealants in children who just had their molars erupt. This way your child’s teeth are kept from plaque and tartar buildup. Over the years, the plastic coating thins and may call for a replacement sealant. Placing a dental sealant requires only one dental appointment and follows three simple steps. A dental hygienist will prepare the target tooth by cleaning it to remove plaque and food debris in the fissures. An acidic gel is applied to roughen the surfaces of the tooth. Roughening the surfaces is necessary to make the dental sealants bond properly. The acidic gel is removed and the tooth is dried. Afterwards, the sealant is applied using a brush. 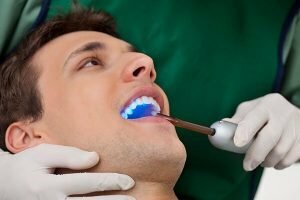 A curing light is focused on the tooth for about 30 seconds to harden the bonded material. The dental sealant is checked to ensure the accuracy of the procedure. We encourage everyone to explore this amazing preventative dentistry service. A Plus Dental strongly emphasises the importance of dental sealants in children for optimum teeth protection.